My friend Christopher Ng tried to scope the problem that Financial Independence is trying to solve. Without a monster, there is no use for a powerful sword. So we need to find that monster. I look at the problem and its not something that our previous generation have not faced before. His emphasis is that they happened younger, and each stable job cycle becomes shorter. If I were to describe, it is as if that white collar workers are going to suffer from the job uncertainty that plague blue collar workers in the past. Since I have been reading and writing on this topic for some time, I would like to chip in what I think. I think deep down, we are trying to find a utility, or a function for the money we saved. It is just that we failed to articulate what it is. To a certain extent, money at its core does nothing. Money has some meaning when you exchange it for something. It becomes useful when you spend it now. But why would we not spend it? Quite possibly you value what you will spend on later to be higher than what you will spend on today. This is why we saved up for marriage, for a car, for a down payment. However, I see many of us just save and save. When you ask them what they are saving for, they do not have a good answer for you. I see 2 reason why folks would put away a lot of money and not spend it today. The first reason is that they do not have a lot of things to buy today, so they are accumulating for the time when they have something they need. The second reason is something they find it difficult to articulate out. And it is likely that they have this haunting feeling that if they spend it all today, they are ill preparing themselves for an unknown future where the money might saved them. Why they will get this feeling is because they suffered from some financial trauma in the past. They get so scarred that they want to fortified themselves from it. A lot of the trauma that affects us happens in our childhood. So those who grow up in poorer environment would feel it more. Those with more comfortable financial background would get haunted when they see some close friends going through these problems. This left a lasting impression in their mind, lasting enough that it made them cautious as well. If you think about it, the first reason might also be a manifestation of this second reason. This is financial insecurity. It varies from person to person. And I think that is the main monster that financial independence is trying to solve. Some monster that is in the mind. The solution is not so much of financial independence, but converting to solve this financial insecurity. So to solve this financial insecurity, to gain more security, we put away more money instead of spending it. And like many things there is a spectrum of financial insecurity. In the diagram above, to the right it is someone who have zero anxiety about their financial situation. They are 100% risk seeking in how they carry out their life. On the left side, it is someone who cannot stand any financial trauma to their lives. They are 100% risk adverse. Depending on your risk adverse nature, you would find yourself somewhere along the line. The more risk adverse the more you moved on to the left side. I have put out various wealth saving milestones that a person would venture to save, depending on their level of risk adverse nature. Those that feel so financially secure, would not save any money today. They probably have not suffer much financial trauma in their lives, or that they have so much supply of money that they see no reason to save. You remember about the Emergency Fund we talked about. It is a progression in your journey to fortify against financial insecurities. In a way to build up resilience as well. We hear this question a lot: is 6 months of emergency fund enough? We don’t know your situation, your level of financial security you need. If you are not comfortable, put away more! As you progress further you put away more lump sum. Then the wealth you put away is so much that, you can get a recurring cash flow from it. This cash flow might be large enough to provide part or all your annual expenses. Your wealth might not last if you withdraw an initial amount of 5-6% of your wealth (for subsequent years, you increase that amount by the inflation rate). For those that wants absolute security, or have the most financial insecurity, they would put away so much that they only withdraw 1-2% of their wealth in the initial year. For those that is ultimate, even if they have that, they would still continue to work! I just read an interview with documentary maker Abigail Disney. She also happens to be the grand daughter of the co founder of Walt Disney. The whole piece is about her growing up with money, the pitfalls, her insecurities, and why she gave away so much money. They asked people who inherited money, “What amount of money would you need to feel totally secure?” And every single one of them, no matter what they had, named a number that was roughly twice what they inherited. So that’s what you need to know about money, right? If that is your primary measure of success or value in life, then good luck with that, because it will never feel good. So it turns out that it is not so easy to reach a state of financial security. Maslow created this famous hierarchy of needs that sought to explain our deficiency and how we sought to address our deficiencies. We are motivated to achieve certain needs and that some needs take precedence over others. Those at the bottom are what is more important to us as human beings. We sought to address our physiological deficiencies, before the safety. These are the basic. Then we address the areas that give us more purpose in life, Love and Belonging, and Esteem. If we look at financial security and independence, financial independence is more worth while as it creates the platform for us to build relationships and pursue the career and life goals. The problem with that is that we do not know whether we need to accumulate so much money, just so that we can build strong relationships, have a good career and live a rich life. There is a lot of subjectivity there as you go higher up the pyramid. 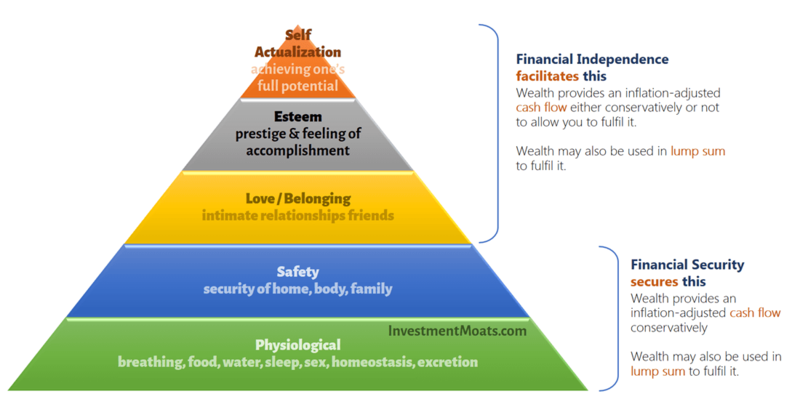 However, those areas closer to the base of the pyramid, safety and physiological, you can see where your wealth can give them more predictability. A lot of our insecurities when we are poor, stems from the uncertainty of whether we can have food, water, a place to live and whether we can keep the family intact. Thus, the pursuit of financial security can address this. It allows you to ascend up the Maslow Hierarchy of Needs. What Constitute the Areas that we need to Secure Financially? Financial Security is to have a cash flow to secure our Essential Annual Expenses. So what are our essential expenses? We can argue till cow comes home on this but I think Maslow give us a good idea what should consider essential. A lot of what is deemed essential is for us to address our basic survival needs. We take a look at 3 different profile: the single lady, the married with no kids and married with 2 kids. Based on these categories, and we are stringent about it, the annual expense would be lesser than your current expenses. As you have more members in the household, your expenses is more. I also put out what would the expenses be like, if the three profile of people do not have a mortgage, or do not need rent. The single will live with the parents, the married couple have paid of their mortgage. I think for some people, their anxiety comes from remembering how tough it was for their parents during the Asian financial crisis, when they do not have a job and need to find money to pay off their mortgage. There are financial reasons to prolong a mortgage, but it definitely provides financial security if you would just pay off your mortgage. The way to look at your wealth is that you are trying to build up a personal insurance against any cash flow volatility that might impact your essential expenses. This personal insurance prevents you from being put in the streets, not begging others for money to put food on the table and so that your kids can continue to study. It is also reduces the stress levels in the family. But I think most of the time, it is to prevent you from freezing up mentally, so that you can make the important decisions that has got less to do with money. That will depend on your level of financial security needed. This is correlated to your insecurity. I picked out 2 examples from the 6 monthly essential expenses example, the single lady who who rents a home, and the married couple with kids, but paid off their mortgage. You can look at this as the milestones for your wealth accumulation. Aim for the first one then upon reaching, hit the next one. The first one allows you to survive for 6 months should you get unemployed. You would eventually accumulate enough such that by withdrawing a conservative amount from your wealth, your wealth can last you for a long time. The cash flow is enough for you to keep tapping it, should you need it. In most cases, your financial ordeal would last you 6 months, 1 year or 2 years. You would eventually find employment. So some milestones, such as a 5% initial withdrawal rate may be rather risk seeking or not conservative for retirement. However, if you are not going to consistently tap your wealth for annual cash flow, then perhaps 5% withdrawal rate is rather conservative in this use case. The more wealth you accumulate, the more conservative your financial security you get. The table above shows the wealth that you need to accumulate if you are married with 2 kids but paid off your mortgage. The sum of money is bigger. However, if you determine that your essential expense is lower than $30,000/yr then your conservative financial security amount might be lesser! For about the past 5 years, I have been publishing my annual expenses. You would notice that based on the expenses, I do constantly project how my annual expenses will look like for financial security and financial independence. How much you need, is very much linked to the line items of your expenses, and how much they add up. And I do have a fair share of financial insecurities to keep tabulating stuff like this. If I take my annual survival expenses listed in the 2018 expense report, which are my essential expenses I believe i need in case things go wrong, it comes up to $11,880. I could work out my wealth accumulation ladder like the one presented previously. I do feel strongly that this annual essential expense is the bare minimum expense that i need to keep life going, and therefore it has to be conservative as possible. So what I aimed for is somewhere close to a 3% initial wealth withdrawal rate. Given that my stock portfolio should be able to generate an expected return of around 7%, it should be rather conservative to take out an initial sum of 3% of the portfolio, and for subsequent years, the cash flow to be adjusted for inflation. In all honesty, unless I retire, it is not likely I will need the cash flow consistently for years. But this is for me, and your mileage might vary due to your lifestyle, and the level of financial security you require. What I learn over time is that even if you have wealth, it is rather challenging to re-program some deep seated money trauma in your childhood. We see people with $1 million and feel they do not have enough. As a third party, we can clearly see that the person is in a much better position then they were when they started. That $1 million can provide even a $30,000 annual income on a very conservative basis. There is a difference if the financial security is externally driven by what is shared by your friends, financial adviser, investment banker or a guru. Most of the time, you only hear a part of how having wealth is a security. You will more likely feel more secure when internally, you really understand why your plan gives you that security. For example, a lot of people shoot for say $500,000 in wealth, because some guru like Investment Moats tell them that if you can live on 3% of $500,000 in the initial year, you should be rather safe. what about those fearful market draw downs? How long would $500,000 last? If you have these questions, it is likely you do not have a wealth machine. Wealth machine is a term I use to describe your way of building and managing your wealth in a sustainable manner. It is not so much of a wealth machine because you have not internalize some of the finer details of your plan. If you understand what Investment Moats wrote about in detail, you would realize that 3% is adjusted for inflation, how it is adjusted. You would understand the plan’s assumptions, and whether they are deal breakers, or what we can do to mitigate the challenges. You would understand how market works in general and what are the typical strategies to tackle them, and how to implement them. Here is another one: How would saving up $50,000 help you in your financial security? If you do not buy anything and you build up $50,000, you would say you can “use this when you need it”. But what is the need? You think through #1 and #2 and see if what you have in #1 are really essential. And it might be rather empowering to know that with that you can tackle 50 months of your monthly essential expenses. That is probably a 4 years runway, which is a long time for you to make big changes in your life should you need. Knowing the plan in detail, and executing them, living with them for a while will build your confidence and give you security. If you do not internalize the plan and depend on what others say, you will always have that lingering fear at the back of your head, and you will not feel secure. There are people in this world that want their plans to be perfect in life, at work. Some of them would not be able to recover if they face some big set back. Those folks who are more stoic tend to do better. Their own self talk tends to be positive and allow them to go past the setback and try to get things working. In the financial independence and retirement realm, there are many that cannot accept variability in their plan. They want every plan to be workable in a guaranteed manner. So I will tell them that, if you want a conservative retirement plan that will work definitely, withdraw 1.5% of your wealth. So if you need $48,000/yr, you need to build up 48000/0.015 = $3,200,000. And they will feel so deflated. The truth is that many people can be more secured, more happy if they know how to be systematic flexible in their lives. To be flexible, you got to have a mind that is curious, likes to test things, reflect upon things, and adjust accordingly. If you have thought of, and experience these things, your mind understands the world better in a different light. You realize there is not just one path to things. You realize there is a middle ground that you can get the good parts while mitigating the bad parts. These solves insecurities by not avoiding them, but tackling them often. You get so used to it that it does not become a big fear in your head. A very hands on lady will have less insecurities than a middle management lady who only knows how to do a technical and management aspect of her job well. This is because the lady have already learn to earn money here and there, on and off, and knows if things do not go well. Then go back to working. The middle management lady will have a big problem even though she earned a lot people she things that if she does not make $100,000/yr she could not survive. If her industry is declining, and they are not hiring, what is she going to do to still earn $100,000 so that she can pay for her $85,000 expenses? The elegant thing is your pursuit to address your financial security is a milestone in your bigger picture to retire early or for your retirement. Building wealth is always great because you can use it for something. If you do not use too much of it as an insurance policy against volatile cash inflow, then your accumulation would go towards the funding of your official retirement. Ramit Sethi did some research some time ago, when he tried to find out why does people want to earn $1000 on the side. He found out that the folks are likely not looking to quit their job. Rather, it is so that they can have optionality in life. My opinion is that we are suppose to be meant to do something. The question is whether we are paid for it or not. When we are free from worry about putting food on the table, it might allow us to focus and do our best work yet. This might invariably improve our chances to get a better compensation at work. You can say that the rise of the gig economy makes financial independence necessary, or that it becomes very easy in this age for your skill to be outdated. You could also make a case that work pressures are greater, and workers have to do much more, to the point it borders on being severely underpaid. These are financial insecurities, and this is the monster that we are trying to frame. And why we felt that the pursuit of accumulating wealth is worth while. Ultimately, we cannot deny that the pursuit of financial independence are likely to encourage actions that might lead to depressive behaviors. I picked out the best part, and sped up the podcast in the clip above for you to listen to (which might make it sound weird). The host and Emma both achieved financial independence before they turned 30 years old. Both are still working. And they reviewed their lives and their pursuit of financial independence to identify what made them pursue wealth accumulation and what they missed out on. And a lot of the reasons are financial anxiety. Worse, many reached the point of financial independence, and they asked what’s next? This gives us an idea, they do not know what kind of life they are saving for. When we started that financial independence pursuit, we might not know how much our philosophy of life will change 5, 10, 20 years later. The person that plan to pursue financial independence is a different person than the person that reached financial independence. And this might be the reason there is a mismatched in expectations. It is like one person is planning something for another person’s life. That might not always end well. For a lot of people, there is utility in providing a stable cash flow to insure against volatile salary affecting your family’s ability to function at the most fundamental level. Did you think I have identified the “monster” well? What is your take on this (or the figures presented)? Let me know. I think alot of in their 20 and 30s will ask now i have family have kids how can i have emergency fund and prepare for financial independence. Hi Mao, I think so, especially when they have episodes of work stress that hit them. Great article, keep it up. By the way , there is always one thing that puzzle me . How come people can have food expense of more than 200 per month , usually the maximum that i have ever reach is 300 only and that is after inclusive of 2 buffet with friends in that particular month. How can you keep your food expense so low! My Monster is the Black Swan. 2. Financial Crisis : Two bank accounts frozen and funds inaccessible for over a year, one bank insolvent but judged, “too large to fail” and was absorbed by another bank, another nail biting episode. 3. Government action. In my case the FATCA and tax regulations imposed by the US, this resulted in the ZKB (Swiss bank) forcing all foreign held accounts and assets held at the bank to be liquidated inside of a few months and a cheque sent off. The bank no longer wanted to jump through hoops for the US taxman. The unknown unknowns are the killers. Wow thanks for sharing. did they all hit together? >How come people can have food expense of more than 200 per month , usually the maximum that i have ever reach is 300 only and that is after inclusive of 2 buffet with friends in that particular month. 1. Are you including the cost of all of your meals for all 28/29/30/31 days of the month? Breakfast, lunch, dinner, supper, snacks? Do you include whatever drink you ordered beside the meal (if you do)? 2. Do you cook meals at home, or someone else in your household does? If you do, do you include the cost of ingredients? You might want to estimate and include the cost of gas, condiments, etc that goes into meal preparation. 3. Do you work/study in the city area where lunch can be more costly, or do you have access to cheap hawker food for lunch/ dinner?